Wild currants here in Oregon's fertile Willamette Valley are a down-home touch in any landscape. Some bear delicious fruit, some pop in spring with colorful blossoms. Most of these northwest native shrubs change leaf color from green to bright golds and scarlets in the fall. Sizes at maturity range from 3 to 15 feet on average. They are, for the most part, resistant to pests and diseases. Any of these beauties will give additional wildlife value for food or nesting. Click on links below for details on each species. As yet, not all northwest native currants are covered in this website, though that may be done some time in the future. 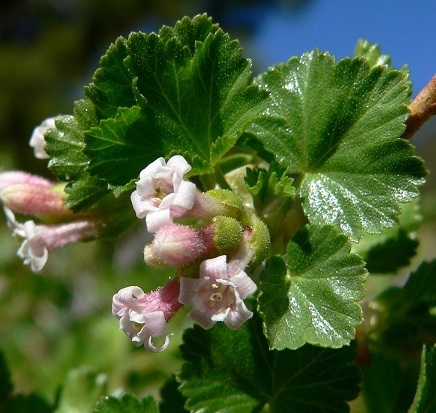 For now, we have information about only five of our northwest native currants. 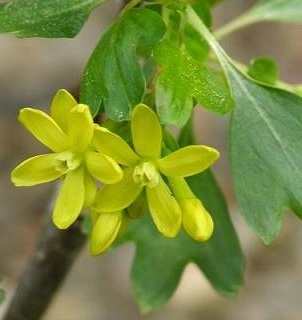 Ribes aureum var. aureum (Golden Currant) Fine for native gardens, this currant is at home in much of North America, except the extreme southern and eastern states. It is hardy in USDA zones 2-10 and is highly tolerant of drought. 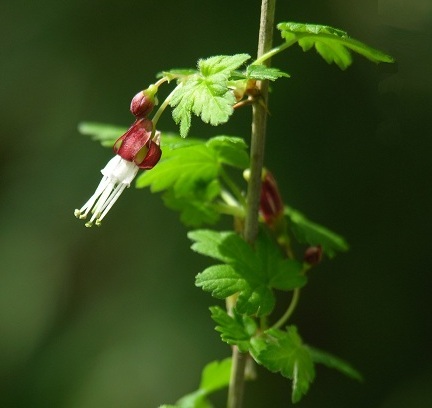 Ribes cereum var. cereum (Wax Currant) This mid-size deciduous member of the currant family is usually found on the eastern side of the Cascades where the weather is more sunny and drier than the west side. Ribes divaricatum (Black Gooseberry) The flowers of this plant sort of resemble those of fuschias. 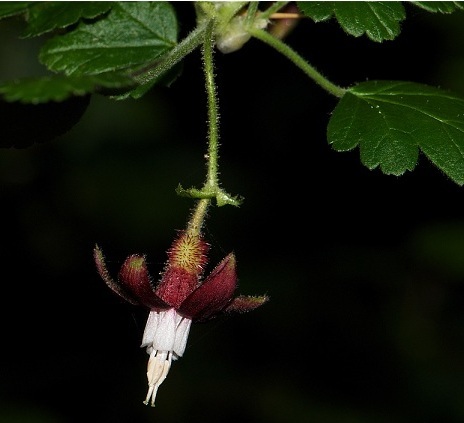 After blooming, the hips of each bloom grow and form juicy berries which make excellent jam. Ribes menziesii (Prickly Gooseberry) Instead of the usual shrubby shape common to other native currants, this one has arching branches that root where they touch the ground. Fruit is relished equally by birds and humans. 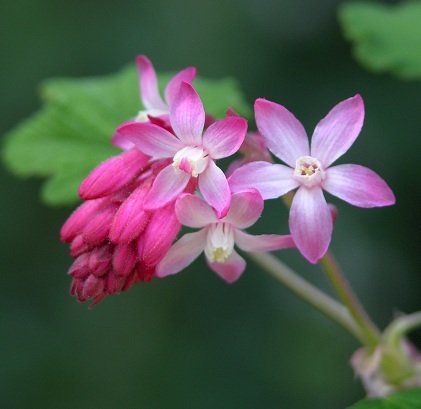 Ribes sanguineum (Red-Flowering Currant) This currant has found great favor with landscape gardeners. Not surprising--blooming bright to pale pink from head to toe, blue fruits follow the flowers, and finally in late autumn the leaves color up for a fine fall show.